The circular_buffer_space_optimized container is an adaptor of the circular_buffer. 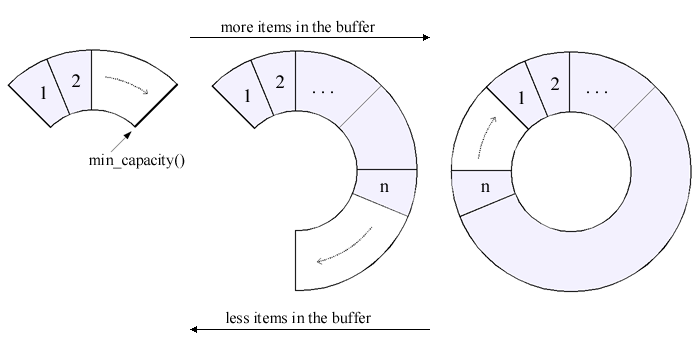 The functionality of the circular_buffer_space_optimized is similar to the base circular_buffer except it does not allocate memory at once when created rather it allocates memory as needed. (The predictive memory allocation is similar to typical std::vector implementation.) Moreover the memory is automatically freed as the size of the container decreases. Figure: The memory allocation process of the space optimized circular buffer. The min_capacity() of the capacity controller represents the minimal guaranteed amount of allocated memory. The allocated memory will never drop under this value. The default value of the min_capacity() is set to 0. Note that some of the links point to the original circular_buffer if the functionality is the same. The auto-resizing mode of the space optimized circular buffer can be useful in situations when the container can possibly store large number of elements but most of its lifetime the container stores just few of them. The usage of the circular_buffer_space_optimized will result in decreased memory consumption and can improve the CPU cache effectiveness. The circular_buffer_space_optimized is defined in the file boost/circular_buffer.hpp. There is also a forward declaration for the circular_buffer_space_optimized in the header file boost/circular_buffer_fwd.hpp. Random Access Container, Front Insertion Sequence and Back Insertion Sequence. Following public types are specific to the circular_buffer_space_optimized. Description of the public types common with the circular_buffer can be found in the circular_buffer's documentation. capacity_type Capacity controller of the space optimized circular buffer. The capacity() represents the capacity of the circular_buffer_space_optimized and the min_capacity() determines the minimal allocated size of its internal buffer. The converting constructor of the capacity_control allows implicit conversion from size_type-like types which ensures compatibility of creating an instance of the circular_buffer_space_optimized with other STL containers. On the other hand the operator size_type() provides implicit conversion to the size_type which allows to treat the capacity of the circular_buffer_space_optimized the same way as in the circular_buffer. Create an empty space optimized circular buffer with zero capacity. Since Boost version 1.36 the behaviour of this constructor has changed. Now it creates a space optimized circular buffer with zero capacity. Create an empty space optimized circular buffer with the specified capacity. The amount of allocated memory in the internal buffer is capacity_ctrl.min_capacity(). The capacity controller representing the maximum number of elements which can be stored in the circular_buffer_space_optimized and the minimal allocated size of the internal buffer. An allocation error if memory is exhausted (std::bad_alloc if the standard allocator is used). Create a full space optimized circular buffer with the specified capacity filled with capacity_ctrl.capacity() copies of item. The amount of allocated memory in the internal buffer is capacity_ctrl.capacity(). The element the created circular_buffer_space_optimized will be filled with. Create a space optimized circular buffer with the specified capacity filled with n copies of item. The amount of allocated memory in the internal buffer is max[n, capacity_ctrl.min_capacity()]. The number of elements the created circular_buffer_space_optimized will be filled with. Creates a copy of the specified circular_buffer_space_optimized. The amount of allocated memory in the internal buffer is cb.size(). The circular_buffer_space_optimized to be copied. Linear (in the size of cb). Create a full space optimized circular buffer filled with a copy of the range. first and last have to meet the requirements of InputIterator. The amount of allocated memory in the internal buffer is std::distance(first, last). The beginning of the range to be copied. The end of the range to be copied. Linear (in the std::distance(first, last)). Create a space optimized circular buffer with the specified capacity (and the minimal guaranteed amount of allocated memory) filled with a copy of the range. If the number of items to be copied from the range [first, last) is greater than the specified capacity_ctrl.capacity() then only elements from the range [last - capacity_ctrl.capacity(), last) will be copied. The amount of allocated memory in the internal buffer is max[capacity_ctrl.min_capacity(), min[capacity_ctrl.capacity(), std::distance(first, last)]]. Linear (in std::distance(first, last); in min[capacity_ctrl.capacity(), std::distance(first, last)] if the InputIterator is a RandomAccessIterator). Invalidates all iterators pointing to the circular_buffer_space_optimized (including iterators equal to end()). Linear (in the size of the circular_buffer_space_optimized). Following public member functions of the circular_buffer_space_optimized have different behaviour from the base circular_buffer. Description of the public member functions with the same behaviour can be found in the circular_buffer's documentation. true if the number of elements stored in the circular_buffer_space_optimized equals the capacity of the circular_buffer_space_optimized; false otherwise. Does not invalidate any iterators. Constant (in the size of the circular_buffer_space_optimized). Get the maximum number of elements which can be inserted into the circular_buffer_space_optimized without overwriting any of already stored elements. Get the capacity of the circular_buffer_space_optimized. Change the capacity (and the minimal guaranteed amount of allocated memory) of the circular_buffer_space_optimized. If the current number of elements stored in the circular_buffer_space_optimized is greater than the desired new capacity then number of [size() - capacity_ctrl.capacity()] last elements will be removed and the new size will be equal to capacity_ctrl.capacity(). If the current number of elements stored in the circular_buffer_space_optimized is lower than the new capacity then the amount of allocated memory in the internal buffer may be accommodated as necessary but it will never drop below capacity_ctrl.min_capacity(). Invalidates all iterators pointing to the circular_buffer_space_optimized (except iterators equal to end()). For more information about the shrink-to-fit technique in STL see http://www.gotw.ca/gotw/054.htm. Change the size of the circular_buffer_space_optimized. If the new size is greater than the current size, copies of item will be inserted at the back of the of the circular_buffer_space_optimized in order to achieve the desired size. In the case the resulting size exceeds the current capacity the capacity will be set to new_size. The amount of allocated memory in the internal buffer may be accommodated as necessary. Linear (in the new size of the circular_buffer_space_optimized). If the current number of elements stored in the circular_buffer_space_optimized is greater than the desired new capacity then number of [size() - capacity_ctrl.capacity()] first elements will be removed and the new size will be equal to capacity_ctrl.capacity(). If the new size is greater than the current size, copies of item will be inserted at the front of the of the circular_buffer_space_optimized in order to achieve the desired size. In the case the resulting size exceeds the current capacity the capacity will be set to new_size. Makes this circular_buffer_space_optimized to become a copy of the specified circular_buffer_space_optimized. Invalidates all iterators pointing to this circular_buffer_space_optimized (except iterators equal to end()). Assign n items into the space optimized circular buffer. The content of the circular_buffer_space_optimized will be removed and replaced with n copies of the item. The amount of allocated memory in the internal buffer is n.
The number of elements the circular_buffer_space_optimized will be filled with. The element the circular_buffer_space_optimized will be filled with. Assign n items into the space optimized circular buffer specifying the capacity. The capacity of the circular_buffer_space_optimized will be set to the specified value and the content of the circular_buffer_space_optimized will be removed and replaced with n copies of the item. The amount of allocated memory will be max[n, capacity_ctrl.min_capacity()]. Assign a copy of the range into the space optimized circular buffer. The content of the circular_buffer_space_optimized will be removed and replaced with copies of elements from the specified range. Assign a copy of the range into the space optimized circular buffer specifying the capacity. The capacity of the circular_buffer_space_optimized will be set to the specified value and the content of the circular_buffer_space_optimized will be removed and replaced with copies of elements from the specified range. If the number of items to be copied from the range [first, last) is greater than the specified capacity then only elements from the range [last - capacity, last) will be copied. The amount of allocated memory in the internal buffer is max[std::distance(first, last), capacity_ctrl.min_capacity()]. Swap the contents of two space optimized circular buffers. this contains elements of cb and vice versa; the capacity and the amount of allocated memory in the internal buffer of this equal to the capacity and the amount of allocated memory of cb and vice versa. The circular_buffer_space_optimized whose content will be swapped. Insert a new element at the end of the space optimized circular buffer. If the circular_buffer_space_optimized is full, the first element will be removed. If the capacity is 0, nothing will be inserted. The amount of allocated memory in the internal buffer may be predictively increased. The element to be inserted. Insert a new element at the beginning of the space optimized circular buffer. If the circular_buffer_space_optimized is full, the last element will be removed. If the capacity is 0, nothing will be inserted. Remove the last element from the space optimized circular buffer. The last element is removed from the circular_buffer_space_optimized. The amount of allocated memory in the internal buffer may be predictively decreased. Remove the first element from the space optimized circular buffer. The first element is removed from the circular_buffer_space_optimized. Insert an element at the specified position. pos is a valid iterator pointing to the circular_buffer_space_optimized or its end. The item will be inserted at the position pos. If the circular_buffer_space_optimized is full, the first element will be overwritten. If the circular_buffer_space_optimized is full and the pos points to begin(), then the item will not be inserted. If the capacity is 0, nothing will be inserted. An iterator specifying the position where the item will be inserted. Whatever T::operator = (const T&) throws. Insert n copies of the item at the specified position. The number of min[n, (pos - begin()) + reserve()] elements will be inserted at the position pos. The number of min[pos - begin(), max[0, n - reserve()]] elements will be overwritten at the beginning of the circular_buffer_space_optimized. An iterator specifying the position where the items will be inserted. The number of items the to be inserted. The element whose copies will be inserted. Linear (in min[capacity().capacity(), size() + n]). Consider a circular_buffer_space_optimized with the capacity of 6 and the size of 4. Its internal buffer may look like the one below. For comparison if the capacity would not be preserved the internal buffer would then result in |1|2|0|0|0|0|0|3|4|. Insert the range [first, last) at the specified position. Valid range [first, last) where first and last meet the requirements of an InputIterator. Elements from the range [first + max[0, distance(first, last) - (pos - begin()) - reserve()], last) will be inserted at the position pos. The number of min[pos - begin(), max[0, distance(first, last) - reserve()]] elements will be overwritten at the beginning of the circular_buffer_space_optimized. An iterator specifying the position where the range will be inserted. The beginning of the range to be inserted. The end of the range to be inserted. Linear (in [size() + std::distance(first, last)]; in min[capacity().capacity(), size() + std::distance(first, last)] if the InputIterator is a RandomAccessIterator). For comparison if the capacity would not be preserved the internal buffer would then result in |1|2|5|6|7|8|9|3|4|. Insert an element before the specified position. The item will be inserted before the position pos. If the circular_buffer_space_optimized is full, the last element will be overwritten. If the circular_buffer_space_optimized is full and the pos points to end(), then the item will not be inserted. If the capacity is 0, nothing will be inserted. An iterator specifying the position before which the item will be inserted. Insert n copies of the item before the specified position. The number of min[n, (end() - pos) + reserve()] elements will be inserted before the position pos. The number of min[end() - pos, max[0, n - reserve()]] elements will be overwritten at the end of the circular_buffer_space_optimized. Insert the range [first, last) before the specified position. Elements from the range [first, last - max[0, distance(first, last) - (end() - pos) - reserve()]) will be inserted before the position pos. The number of min[end() - pos, max[0, distance(first, last) - reserve()]] elements will be overwritten at the end of the circular_buffer. Remove an element at the specified position. pos is a valid iterator pointing to the circular_buffer_space_optimized (but not an end()). The element at the position pos is removed. An iterator pointing at the element to be removed. Iterator to the first element remaining beyond the removed element or end() if no such element exists. Erase the range [first, last). The beginning of the range to be removed. The end of the range to be removed. Iterator to the first element remaining beyond the removed elements or end() if no such element exists. Iterator to the first element remaining in front of the removed element or begin() if no such element exists. Basically there is no difference between erase(iterator) and this method. It is implemented only for consistency with the base circular_buffer. Iterator to the first element remaining in front of the removed elements or begin() if no such element exists. Basically there is no difference between erase(iterator, iterator) and this method. It is implemented only for consistency with the base circular_buffer. Remove all stored elements from the space optimized circular buffer. The idea of the space optimized circular buffer has been introduced by Pavel Vozenilek. Added new methods is_linearized() and rotate(const_iterator). Changed behaviour of the circular_buffer_space_optimized(const allocator_type&) constructor. Since this version the constructor sets the capacity to zero. Use, modification, and distribution is subject to the Boost Software License, Version 1.0.